Here at Saffron we are always monitoring social media to ensure we keep up with current trends and wedding ideas, as well as coming up with our own of course! One of the new concepts we have introduced this year, ideal for wedding catering, is themed food stations which is a fantastic way for your guests to interact with food and each other, whilst offering a really informal way to enjoy lunch! 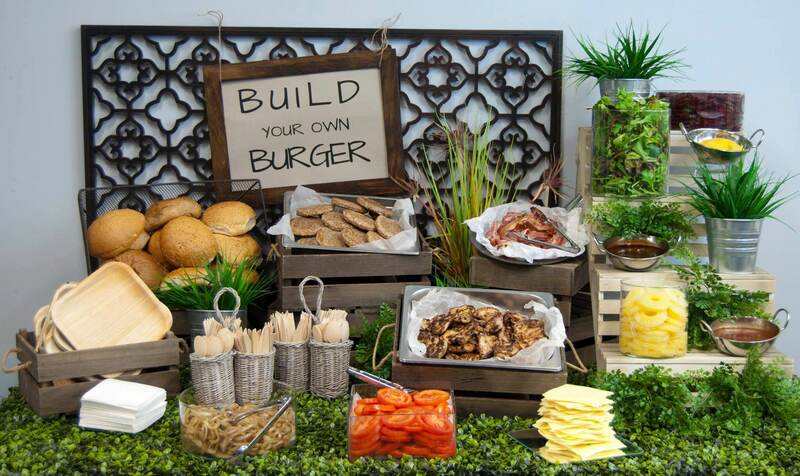 Our first focus for event catering is on a ‘Build your own Burger’ station, wherein our chefs will freshly cook a range of burgers for the guests, who will them help themselves to their choice of burger, plus a selection of sides such as cheese, fried onions, pineapples, jalapenos etc. to create a delicious feast of a burger, designed by themselves! This unique idea is a great opportunity for your guests to enjoy food to their own tastes and the majority of event venues are ideal to set up the station. The possibilities to theme food stations are endless and over the coming months we will be looking into ideas such as Fusion Feasts (a take on Japanese Sushi etc. ), Sweet Treats (delicious tempting desserts such as macaroons, mini dessert pots, deconstructed desserts) and Cocktail City (a tantalising range of our carefully selected cocktails), all of which will offer your guests gourmet catering but with a twist! Our team have some fantastic ideas, so please do contact us to discuss further!